Bangkok – The northern and northeastern regions of Thailand experienced a massive tropical storm this week, damaging numerous homes. A tropical storm buffeted four villages in Phu Phiangdistrict of Nan province, destroying over 100 homes. Officials worked urgently with police to mitigate the effect of the storm, such as repairing roofs and relocating important belongings to safer ground. The northeastern province of Nakhon Ratchasima also experienced storms in four districts including Sikhio, Nong Bun Mak, Non Sung and Chaloem Phra Kiat, with over 200 homes damaged. Provincial officials called for military support from the 21st Military Circle and urged locals to secure their belongings and reinforce their homes. 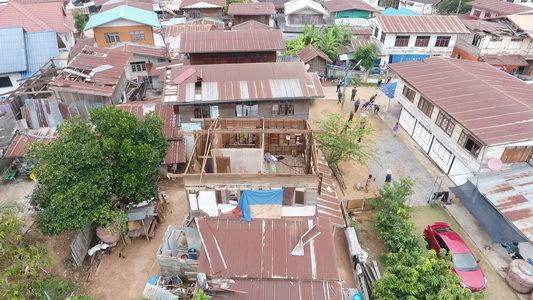 Meanwhile, more than 80 homes in Moo 11 and 12 of Bansamrong in Baankhum district of Khon Kaen province were destroyed, causing over 700,000 baht in damage.